This article was released in August 2008. 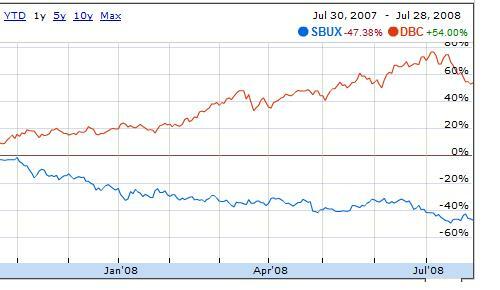 The Starbucks stock price topped out near $40 per share twice in 2006, but has been steadily falling since that double top formation, and now sits at around $14.40 per share. By many accounts 2006 was also the peak of the housing bubble, and leaky home values have issued a strong blow to consumer spending since that time. Two of the hardest hit states in terms of housing are also two states that make up nearly 30 percent of the Starbucks stores in the United States. A $5 latte may not have been a stretch two years ago, but in the midst of this deflating economy and credit crisis consumers are definitely cutting back. McDonalds is another company affected by higher commodity input costs, but that fact is certainly not reflected in their share price which has hit several 52 week highs already this year. McDonalds healthy operating model allowed them to pay off $1 billion in long term debt in 2007. Yet Starbucks, who operated most of its life with insignificant near zero long term debt, suddenly racked up $550 million in long term debt during 2007. 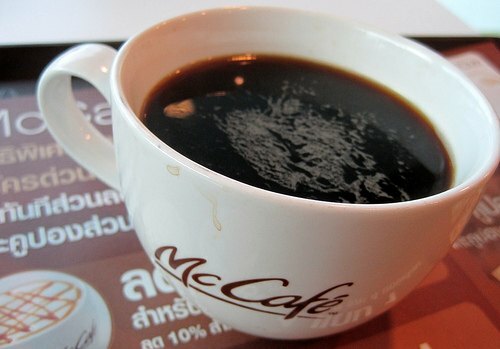 McDonalds is also pursuing the high end coffee market through their aggressive expansion of stores offering the McLatte. And they are doing this at the same time that Starbucks is reversing their expansion into McDonalds traditional breakfast sandwich turf. It seems that every area where Starbucks is struggling and failing, McDonalds is thriving and conquering. But the struggle of Starbucks will not last forever. Howard Schultz is taking significant steps to reverse the downtrend – revising the menu, closing poor performing stores, and even offering a new customer loyalty program. Global commodity prices have also shown signs of leakiness, and any continued price relief on the milk and coffee front could be a potential windfall for Starbucks. If McDonalds is serious about their coffee expansion plans, then they need to take action now. The opportunity to acquire the biggest name in coffee during their weakest days won’t last forever. McDonalds needs to buy Starbucks now. Disclosure: The author of the above article holds a long position in Starbucks stock.